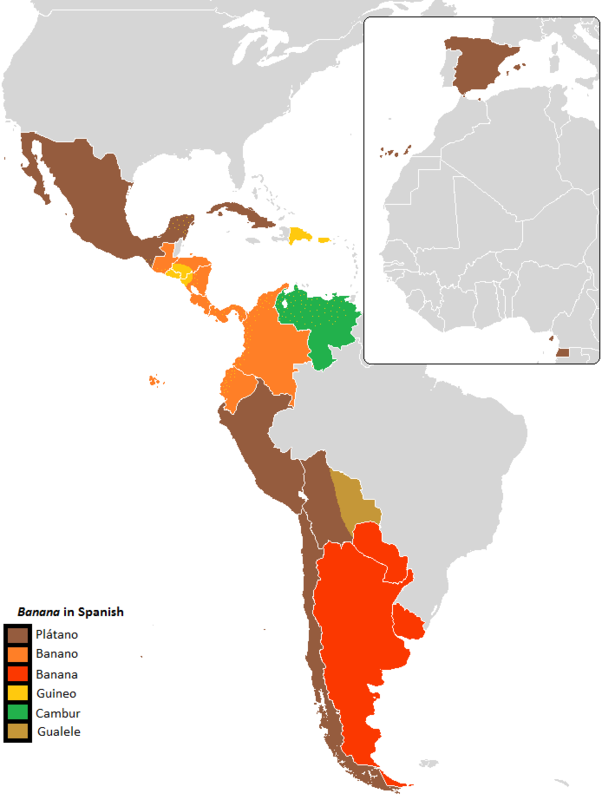 I’ve lived in both the plátano and banano sub-regions of the Spanish-speaking realm and this discrepancy was one I always found curious (likewise, peanut butter is called crema de cacahuate in Mexico, but mantequilla de maní in Costa Rica). I’ve had many humorous encounters with friends from throughout the Spanish-speaking world when words that mean one thing in a particular country have VERY different connotations in another. Questions to Ponder: Why do languages have different vocabularies in distinct places? Why makes a language especially prone to a varied set of regionalized terms? Tags: language, colonialism, diffusion, culture, mapping, regions.